In school, Toby Faye was a moody kid who sat in the back of class and looked like he wanted to be anywhere but there. Claudia Chiametti, the perfect student, always sat in the front row. She might have forgotten him if it weren’t for the fact that his family had been involved in two tragic events. In the small town of Sayville, Long Island, many knew of the family’s dark history. Hired on as a caretaker to Mrs. Faye, Claudia is thrown into the lives of the widow and her son — a world where sadness lingers and old wounds run deep. Now twenty-one, Toby is not so quiet. A mass of muscles and unruly hair, he is a real head turner. He is jaunty with the confidence his masculine good looks afford him. While not immune to his sexual advances, Claudia sees beyond the cocky grin. Up close, his blue-grey eyes expose something else. Despite her father’s stern warnings about the family’s violent history, Claudia is empathetic to their plight and vows to help both mother and son move past the hurt. This endeavor forces her to face situations she never imagines possible. She must be tougher than she’s ever had to be. Does Claudia have the grit to love Toby through his fall? 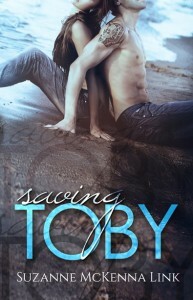 Saving Toby, the author’s debut novel, is the first book of a two-part story that follows the emotional and gritty tale of a young couple’s journey to find themselves. I love to write about young adulthood and the many decisions twenty-somethings have to face at this wonderful, often tumultuous time of growth, change and discovery.